The 302 recently ended a second spell of single deck operation. On formation in 1991 the route was double deck worked using MCW Metrobuses. The early 1990s saw a rash of full size single deck buses entering service in London, generally without any increase in frequency, and the 302 was one victim. However, the Northern Counties bodied Dennis Lances used thereon from 1993 were very unpopular and were withdrawn after only three years, Metrobuses replacing them on the 302 and 113. 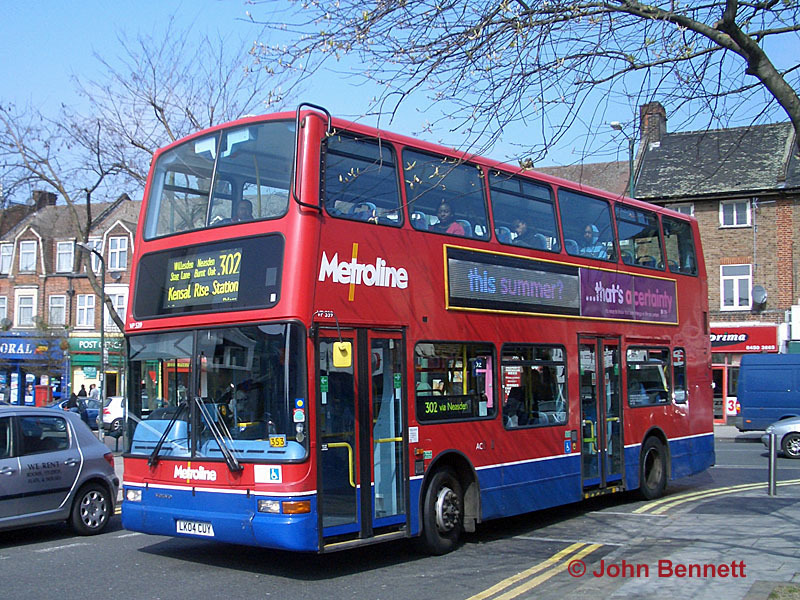 However, the relatively low frequency of the 302 was addressed when the route was re-tendered in 1998, with one extra bus per hour inserted into the schedule, but at the price of single decking again. One of the disadvantages of the earlier single deckers had been their length, making them unwieldy to operate on often bendy routes. This time the type chosen was the much more versatile Dart SLF, with dual door Pointer 2 bodied versions being specified. London Traveller provided some supplementary double deck workings (with Metrobuses!) around school start and finish times. A more major frequency enhancement followed in August 2003, when the Mon-Sat daytime service was upped from every 12 to every 8 minutes, with the evening and Sunday frequency increased to every 12 minutes. This resulted in the double deck workings being withdrawn again. This was almost double the original service level – and although converting from double to single deck at the same time, this differs from many similar conversions in that the single decking occurred separately from (and before) the frequency increase. However, problems with overcrowding quickly resurfaced. Eventually certain workings were converted back to double deck and in April 2010 the full service was restored to double deck working, ahead of a new contract starting in June. Like most operators, Metroline has built up a surplus of low floor double deckers that it is having trouble disposing of, so the 302 provided a convenient home for some of them. They are VP class President bodied Volvo B7TLs, the same type as already used at Willesden, meaning that Willesden is a rare single-type garage, apart from a variation in length (the buses on the 52 are the long wheelbase VPL variant). Two photographs are provided here, and the first shows VP539 (LK04 CUY) turning from Neasden Lane into Birse Crescent, Neasden on Thursday 2 April 2009. The second view shows sister vehicle VP535 (LK04 CUJ) at Kensal Rise Station on service 302 from Mill Hill Broadway on Wednesday 19 May 2010. Both buses are part of a large batch bought for the OPO conversion of routes 6 and 98 in 2004. VPs from an earlier batch based at Holloway have moved in for the 302, having in turn been released by TP class buses from Brentford garage where they were replaced on the 237 by new VWs; in practice all VPs at AC are regarded as common user. 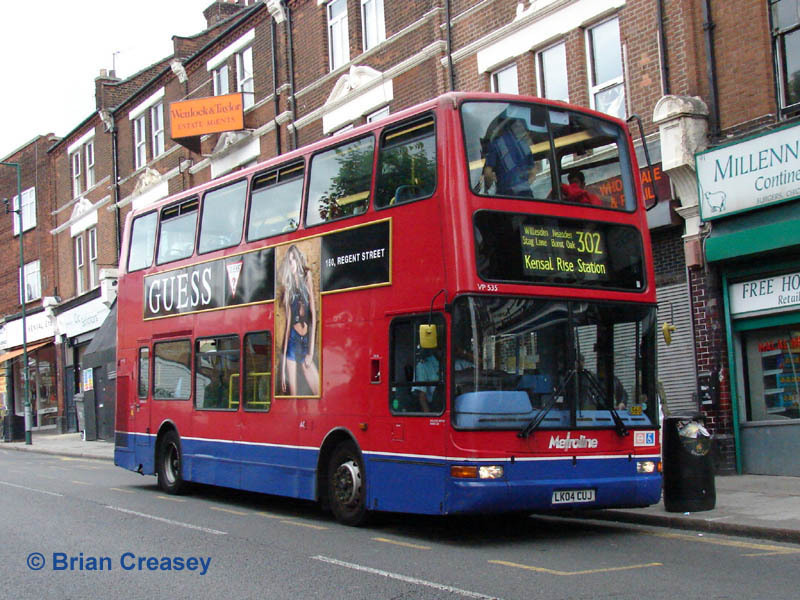 The 302 took over the northern end of route 52 in 1991, the 52 being cut back to Willesden bus garage giving a short overlap between Notting Hill Gate and Willesden – which has been reduced even further by the curtailment of the 302 to Kensal Rise. However, the service levels on the two halves do rather contrast, even following the increases on the 302 – the 52 runs up to every 5 minutes using long wheelbase double deckers.